These days, it seems like everyone is talking politics. If you find yourself relishing these conversations, this part-time job with NextWave Advocacy may be for you (or you can just share it with the person who hijacks every conversation and turns it to politics)! Hiring nationwide, PCs or Macs OK. This is an independent contractor role that is NOT for people who are shy about calling strangers on the phone. Please note that the work is project driven, so it may be really busy sometimes and quite slow at others. [email protected], a respected issue advocacy firm, is seeking telephone-based grassroots organizers for projects involving important legislative and regulatory issues. With your communication skills, you will help people across the country understand the direct impacts policymakers’ proposals have on their lives, and then assist them in making their voices heard. 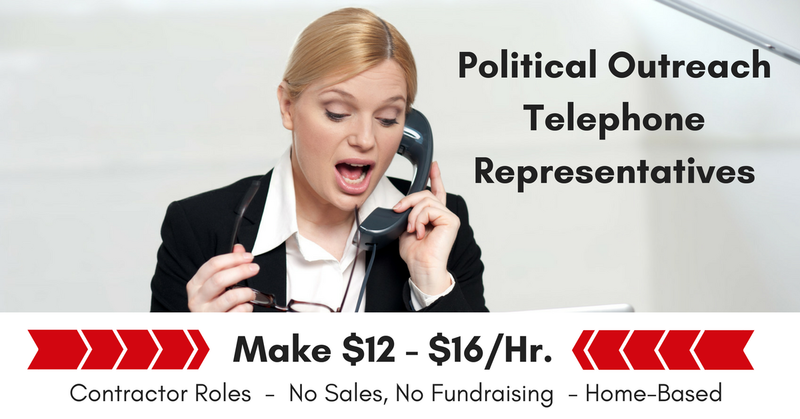 We are looking for tech-savvy, enthusiastic independent contractors to make outbound calls to identify advocates and affect political change. The position requires making outbound educational outreach calls and conducting interviews with citizens across the country on various legislative topics. This project based work is part time or full time depending on your flexibility and availability. You choose your own schedule based on available project hours, work in your own home 20 hours or more, impacting the political landscape. There are NO sales and NO fundraising solicitations in this position. At the end of each project we place our contractors on new issues based on performance, schedule availability and background. Work from anywhere you have a wired internet connection and earn $12 per hour, working 20+ hours/week. Build your own schedule. Weekday, evening, and/or Saturday work is available based on the project parameters and calling time zones. Contractors must have a PC or Mac computer, wired high-speed internet connection, an Ethernet cable to connect the computer to the modem/router and direct access to a printer. Sorry, no tablet/mobile devices or cell-based data connections. Click here for details and to apply. For more jobs like these see our Newest Jobs & Gigs page. To be the first to hear about jobs we post, like our Facebook page. This entry was posted in Hiring Companies, Independent Contractors, Work at Home Jobs. Bookmark the permalink.